Is your OS drive running low on available storage space? That might be the case if you opted for a lower capacity SSD to save a few bucks, especially back before NAND flash memory pricing took a tumble. 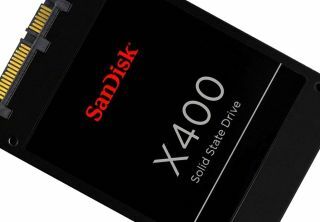 If you've been waiting for the right moment to upgrade to a bigger primary SSD, now might be the time—Newegg has SanDisk's X400 1TB SSD on sale for $257 til midnight tonight. The sale price applies to the 2.5-inch version, not the gum-stick sized drive with an M.2 2280 interface. Most recent motherboards support M.2 drives, though if you built your system a year or more ago, SATA 6Gbps might still be your only option. In any event, the X400 uses triple-level cell (TLC) NAND memory chips. SanDisk rates maximum sequential read and write performance at up to 545MB/s and 520MB/s, respectively. For 4KB random reads, SanDisk lists 95,000 IOPS, with 4KB random write performance pegged at up to 75,000 IOPS. You can snag the X400 on sale here. If you're looking for a less expensive solution and don't need 1TB of storage, Newegg also has SanDisk's Z410 240GB SSD on sale. It's currently marked down to $65, and like the X400, this is a 2.5-inch SATA 6Gbps drive. The Z410 is rated to read data at up to 535MB/s, which is comparable to the X400, but has a slower write speed of up to 440MB/s. 4K random read and write performance is also slower, at up to 36,000 IOPS for the former and up to 66,000 IOPs for the latter. Still, it's a less expensive solution, though the price per gigabyte is about the same (around 26 cents per gigabyte, versus around 25 cents per gigabyte for the X400). Go here for the Z410.